Home » What is Seal-in Circuit ? A Seal-in circuit is a method of maintaining current flow after a momentary switch has been pressed and released. Note : Consider a Relay is used to control the power supply to a motor. Here we are calling this relay as ” Motor Starter Coil “. This Relay another NO contact is used to seal-in or latch the start signal. As start push button is a push & Release type i.e. signal will be available for some time say momentarily and then signal will be lost. 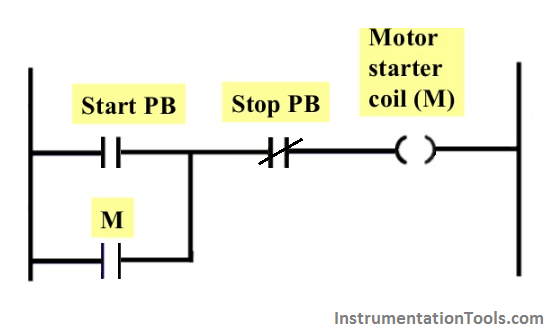 so we have to latch this circuit in order to make motor run continuously even after release of start push button. For this purpose we are using Relay (M) NO contact across Start push button such that it will take care of start signal after start button is released. The seal-in auxiliary contact (NO Contact) of the starter (M) is connected in parallel with the start button to keep the starter coil (M) energized when the start button released. After Start Push button pressed : The Motor starter coil energized and its NO contact becomes NC as shown in below figure. Start Push button will be used to latch the start signal as start push button will be released after pressing ( start button are momentary type ).